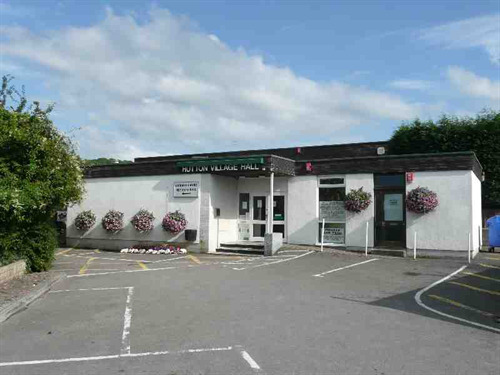 Situated in the centre of the village, the hall is at the heart of social activities for the whole parish. Its multiple facilities can be hired by clubs, societies and individuals from within or outside the parish. Ideal for wedding receptions, birthday parties, meetings, dances, quizzes, concerts and all sorts of social functions; a fully licensed bar can be provided on request. The large main hall with its stage can seat 180 people, and has a fully equipped kitchen. The small hall seats 70, and has an attached kitchenette with hot and cold water and electrics. The Legion Room, which incorporates the bar, seats 40. A floor plan is available here. Free Wifi is available in both halls. Hirers should be aware that Helium Balloons are NOT allowed in the village hall due to the fact that balloons left overnight tend to drift down and set off the alarms necessitating a chargable call out from the alarm company. Many of the events in the hall are shown in the What's On or the Clubs & Groups pages.